Lorde turns 20 today, November 7. Happy Birthday Lorde! Leaving your teenage years behind can be a traumatic experience and she marked the occasion by writing a lengthy tribute to adolescence on Facebook. 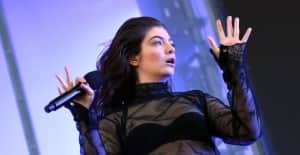 The letter, which you can read in full here, also includes early details on the follow up to Lorde's debut album Pure Heroine. She mentions that the album was written about a "colossal year" that included heartbreak, leaving home, and discovering "in a profound, scary, blood-aching way who I was when I was alone." "Writing Pure Heroine was my way of enshrining our teenage glory, putting it up in lights forever so that part of me never dies, and this record - well, this one is about what comes next," she states. "I just need to keep working a while longer to make it as good as it can be. You'll have to hold on. The big day is not tomorrow, or even next month realistically, but soon." Check out the note here and revisit Lorde's 2014 interview with The FADER.